Laser in-situ keratomileusis (LASIK) is a non-reversible refractive procedure performed by ophthalmologists to correct myopia, hyperopia, or astigmatism. The surgeon uses an excimer laser to cut or reshape the cornea so that light will focus properly on the retina. LASIK is an elective surgery for patients who want to permanently correct myopia (nearsightedness), hyperopia (farsightedness), or astigmatism without eyeglasses, contact lenses, or refractive surgical procedures. The goal for most patients is to be free of any type of corrective lenses. Some patients may find wearing eyeglasses or contact lenses interferes with their careers or hobbies. Many professional athletes have chosen LASIK to improve their performance. However, patients with higher degrees of refractive error will still need some type of corrective lens. LASIK is most commonly performed on myopes. For myopia, the surgeon flattens the cornea; for hyperopia, the surgeon steepens the cornea. Surgeons correct astigmatism by creating a normally shaped cornea with the excimer laser. A new type of LASIK also can treat contrast sensitivity as well as refractive error. Custom LASIK incorporates new eye mapping technology into standard LASIK. The surgeon measures the eye from front to back creating a three dimensional corneal map. This much-more detailed map gives surgeons more specific information for the excimer laser and enables them to correct other abnormalities besides refractive error. LASIK candidates have myopia, hyperopia, or astigmatism; are 18 or older; and have had stable vision for at least two years. The American Academy of Ophthalmology (AAO) estimated that 1.8 million refractive surgery procedures were performed in 2002. LASIK was estimated to account for 95% of those procedures. The first LASIK patients in the late 1990s were in the upper class, or upper middle class, and in their early 30s to mid-40s. The market was limited for the elective procedure that at first could range as expensive as $5,000 per eye. The number of younger patients receiving LASIK (in their early to mid-20s) was expected to rise in 2003 and beyond. The number of procedures also was expected to increase as prices continued to stabilize, and surgery centers and physicians offered payment plans. LASIK is a relatively new procedure. In April 1985, German physician Theo Seiler was the first to use an excimer laser to attempt to correct astigmatism in blind eyes. Experiments with excimer lasers on blind eyes were also completed in the United States in the mid-1980s. The term LASIK was invented by Greek ophthalmologist Ioannis Pallikari, the first surgeon to use the hinged flap technique. Dr. Stephen Brint, as part of a clinical trial in 1991, performed the first LASIK procedure in the United States. As of 2003, there are two types of LASIK. The standard LASIK procedure and custom LASIK, which relatively few surgeons have the technology to perform. Standard LASIK takes from 10 to 20 minutes to perform and the results are immediate. It's standard practice in LASIK operating rooms to have a clock on the wall so patients immediately can note they are able to read a clock face or other items that previously were blurry. Immediately before the procedure, the ophthalmologist may request corneal topography (a corneal map) to compare with previous maps to ensure the treatment plan is still correct. The surgeon may also measure the cornea's thickness if he didn't previously. After these tests, a technician or co-managing optometrist will perform a refraction to make sure the refractive correction the surgeon will program into the laser is correct. Three sets of eye drops will be administered twice before surgery. The first drop anesthetizes the cornea, the second drop prevents infection and the third drop controls inflammation after LASIK. Patients may be given a sedative, such as Valium. This is administered to calm nervous patients or to help patients sleep after the procedure. blinking light of a laser microscope and must fixate his or her gaze on that light. The patient must remain still throughout the procedure. The surgeon checks the refractive numbers on the laser. Because each patient's cornea is shaped differently, the surgeon may have to adjust the level of correction. Laser companies provide an algorithm to determine the correction level, and the surgeon may alter the level because of a patient's special needs. The adjustments are called nomograms. After the adjustments, the surgeon checks the microkeratome blade for defects. The surgeon then indents the cornea to mark the flap location. The surgeon places a suction ring in the center of the sclera. A technician will activate the microkeratome's suction. The patient's vision dims at this point. The surgeon tests pressure by touching the cornea with a tonometer. 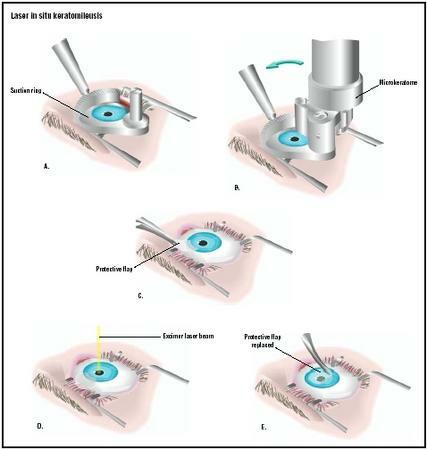 Before using the microkeratome, sterile saline solution is squirted into the suction ring to lubricate the cornea. The microkeratome head is placed in the gear tracks of the suction ring, and the surgeon guides the microkeratome across the suction ring to create a flap. The microkeratome stops just short of traveling completely across the cornea. It leaves a hinge of tissue, commonly called a flap. After the flap is created, the surgeon removes the suction ring and slips a spatula under it and moves it to the side, exposing the stroma (inner cornea). Once the stroma is exposed, the laser ablation begins, ranging from 30 to 60 seconds. The ablation flattens the cornea of myopic patients; steepens the cornea of hyperopic patients; and reshapes the cornea of astigmatic patients. After the ablation, the surgeon replaces the flap. More saline solution is squirted to remove any debris and enable the flap to move back into place without interruption. The surgeon ensures the flap is in place and removes any wrinkles. The surgeon places a shield over the eye to keep the flap in place. No stitches are used. If bilateral LASIK is being performed, the patient must remain still while he is prepared for treatment on the remaining eye. As of early 2003, a handful of ophthalmologists in the United States had the technology to perform custom LASIK. The difference between standard LASIK and custom LASIK lies in the diagnosis and who can be treated. With custom LASIK, surgeons use a wavefront analyzer (aberrometer) that beams light through the eye and finds irregularities based on how the light travels through the eye. It creates a three-dimensional corneal map to create a customized pattern for each patient. For standard LASIK, each patient with the same refractive error is treated with the same setting on the excimer laser, barring a few adjustments. The new technology individualizes treatment not only for refractive errors, but also for visual disorders that previous corneal mapping technology could not detect. As of early 2003, there was only one FDA-approved laser capable of the customized ablations, but others were awaiting approval. Besides the customized excimer laser, the surgical procedure is the same. Surgeons now can treat patients who have higher-order aberrations, such as contrast sensitivity. Therefore, custom LASIK can successfully treat glare, night vision and other contrast problems. Before LASIK, patients need to have a complete eye evaluation and comprehensive medical history taken. Soft contact lens wearers should stop wearing their lenses at least one week before the initial exam. Gas permeable lens wearers should not wear their lenses from three weeks to a month before the exam. Contact lens wear can alter the cornea's shape, which should be allowed to return to its natural shape before the initial exam. The physician will also ask about medication. Some prescription medicines have been known to cause post-surgical scarring or cause flecks under the corneal flap. It's important for the patient to disclose any prescriptions or over-the-counter medicines taken regularly. Allergies to prescription medicine must also be discussed. A complete eye exam will be performed to determine refractive error, uncorrected visual acuity and best corrected visual acuity. A cycloplegic refraction using eye drops to dilate the pupils also will be performed. Other examination procedures include corneal mapping, a keratometer reading to determine the curvature of the central part of the cornea, a slit lamp exam to determine any damage to the cornea and evidence of glaucoma and cataracts. A fundus exam also will be performed to check for retinal holes and macular degeneration and macular disease. Other tests are done to rule out glaucoma. While those tests check general eye health, others more closely relate to the outcome of LASIK surgery. A corneal pachymeter measures the cornea's thickness. This is important because surgeons remove tissue during surgery. A pupilometer measures the pupil when it is naturally dilated in a dark room without drops. Patients with large pupils have been known to have complications after LASIK, such as glare and halos. After the exam, the patient and physician discuss treatment options and expectations. Patients who expect to see perfectly after LASIK are usually not considered good candidates because they usually are dissatisfied with the results. Surgeons also discuss how patients will handle presbyopia, which occurs during the patient's 40s. LASIK does not correct for presbyopia, and patients will need reading glasses to accommodate for reading when presbyopia occurs. Sometimes patients 40 and older opt for monovision to treat presbyopia, where one eye is left untreated or one eye is only partially corrected. Monovision means one eye is for short-term vision and the other is for distance vision. The doctor will advise the patient of any possible LASIK complications, explain the procedure and answer questions. After deciding on a treatment option, the patient is required to sign an informed consent form. At this time, payment will also be discussed. Insurance usually does not cover LASIK, although some offer a limited benefit for the procedure. Some laser centers offer payment plans and some physicians have begun using credit companies to handle payments. LASIK can cost anywhere from $999 to $3,000 per eye. The cost varies greatly from surgeon to surgeon. Most of the fees are global, and cover all the pre-operative and post-operative exams as well as the procedure. Patients should be advised of what the fee covers, and if retreatments to the original surgery are included in that price. The patient is advised to discontinue contact lens wear immediately and refrain from using creams, lotions, make-up or perfume for at least two days before surgery. Patients may also be asked to scrub their eyelashes for a period of time to remove any debris. Patients also must find transportation to and from the surgery, and also to and from the first post-operative visit. Medication and distorted vision make it unsafe for the patients to drive after LASIK. After LASIK, patients may experience burning, itching or a foreign body sensation. They should be advised not to touch the eye as that could damage the flap. Many physicians recommend sleeping after the surgery. Patients may also experience glare, starbursts, or halos that should improve after the first few days. Patients are advised to seek help immediately if they feel severe eye pain, or if symptoms worsen. The first follow-up visit is from 24 to 48 hours after surgery. The physician will remove the eye shield, check the patient's vision, and may prescribe more antibiotic drops or artificial tears. Patients must refrain from strenuous activity, such as contact sports, for at least a month. The use of creams, lotions, and make-up must also be avoided for at least two weeks. Hot tubs and swimming pools should be avoided for at least two months. Patients are advised that refraining from these activities and products will help stem infection and aid healing of the cornea. Patients will have regularly scheduled visits post-LASIK for at least six months. Vision gradually improves the first few months after surgery. In some cases, if the vision does not meet expectations and the surgeon believes it can be further corrected, he will perform an enhancement. Enhancements are usually done for under-correction. Overcorrected patients usually need eyeglasses or contact lenses. Surgeons separate LASIK complications into two categories. Cornea perforation. This complication has almost disappeared because of advances in microkeratome design. Flap complications. Newer microkeratomes also have reduced the likelihood of "free caps," where the cap becomes unhinged. An experienced surgeon replaces the cap after ablation. In some cases, the procedure must be aborted while the eye heals. Laser hot spots. Higher energy surrounding the laser beam can cause irregular astigmatism. Proper laser testing before the procedure eliminates this risk. Central islands. This refers to a raised area in the central part of the treated zone that receives insufficient laser treatment. Any raised area can decrease the laser's effectiveness. The island either shrinks by itself or can be remedied with retreatment. Decentered ablation. This occurs when the laser beam is aimed incorrectly. This can result in permanent halos and ghost images. Undercorrection or overcorrection. Undercorrection can usually be treated with an enhancement, but over-correction will require the use of eyeglasses or contact lenses. Debilitating symptoms. These can be permanent or transient, and include glare, halos, double vision and poor nighttime vision. Some patients may also lose contrast sensitivity. Dry eye. This also can be permanent or transient. Most patients experience some dry eye immediately after surgery. Some patients continue to experience dry eye and are treated with artificial tears or punctal plugs. Displaced flap. Occurs after the eye is hit or rubbed. If immediate attention is given by the surgeon, who must lift the flap and clean under it, no long-term effects occur. Nonspecific diffuse intralamellar keratitis. Commonly known as Sands of the Sahara, this complication can range from corneal haze to eye clouding that resembles swirling sand. It is treated with topical steroids, although severe cases may require eye irrigation. Epithelial ingrowth. The cells of the lower cornea migrate under the corneal cap. The surgeon must lift the cap and remove the cells. If untreated, vision is impaired. Striae. These are wrinkles in the flap that can reduce visual acuity. The surgeon must lift the corneal flap and smooth the wrinkles. Photophobia. Extreme sensitivity to light can last a few days or a week after surgery. Infection. This rarely occurs after LASIK. It is treated with antibiotics . After LASIK, most patients are able to see well enough to pass a driver's license exam without glasses or contact lenses. Some patients will still need corrective lenses, but the lenses won't need to be as powerful. Because LASIK is a relatively new procedure, there is limited information on long-term regression. If patients are being treated for myopia, they should be aware they will have to rely on spectacles with the onset of presbyopia. Information about mortality rates following LASIK is limited because the procedure is elective. Complications that can lead to more serious conditions, such as infection, are treated with topical antibiotics after LASIK. The most serious possible complication from LASIK is blindness from an untreated complication. As of 2000, there had been no reports of blindness-induced LASIK. One incidence of legal blindness was reported after a severely myopic patient had retinal hemorrhages. However, it was inconclusive whether or not LASIK was the causative agent. Nonsurgical alternatives to LASIK are contact lenses and eyeglasses, which can also correct refractive errors. Continuous-wear contact lenses, which a patient can sleep in for as long as 30 days, can provide the same effect as LASIK if the patient wants good vision upon waking. Orthokeratology involves a rigid gas permeable contact lens the patient wears for a predetermined amount of time to reshape the cornea. After removing the lens, it takes weeks for the cornea to return to its normal shape. At that time, the patient repeats the process. Corneal rings and implants are another alternative for myopes. These require surgery without lasers and involve a corrective lens surgically implanted in the eye. One of the biggest benefits to these procedures is that they are reversible. However, they may not provide the crisp vision of a successful LASIK. There also are several different types of intraocular lenses being tested to treat myopia and hyperopia. Conductive keratoplasty. This uses radio frequency waves to shrink corneal collagen. It is used to treat mild to moderate hyperopia. Photorefractive keratectomy ( PRK ). PRK also uses an excimer laser and is similar to LASIK. However, in PRK, the surface of the cornea is removed by the laser. PRK patients have a longer recovery time and may need steroidal eye drops for months after surgery. Its success rate is similar to that of LASIK. Laser thermal keratoplasty (LTK). LTK was approved as to treat hyperopia in 2000. An LTK patient's vision is overcorrected for one to three months, and the effect of improved near vision may diminish over time as distance vision improves. Some regression has been noted. Brint, Stephen F., M.D., Dennis Kennedy, O.D., and Corinne Kuypers-Denlinger. The Laser Vision Breakthrough Roseville, CA: Prima Health, 2000. Caster, Andrew I., M.D., F.A.C.S. The Eye Laser Miracle: The Complete Guide to Better Vision New York, NY: Ballantine Books, 1997. Slade, Stephen G., M.D., Richard Baker, O.D., and Dorothy Kay Brockman. The Complete Book of Laser Eye Surgery Naperville, ILL: Sourcebooks, Inc., 2000. American Society of Cataract and Refractive Surgery. 4000 Legato Road, Suite 850, Fairfax, VA 22033-4055. (703) 591-2220. http://ascrs@ascrs.org. http://www.ascrs.org . "Basik Lasik: Tips on LASIK Eye Surgery." Federal Trade Commission. August 2000 [cited February 22, 2003] http://www.ftc.gov/bcp/conline/pubs/health/lasik.htm . Croes, Keith. "Custom LASIK: The Next Generation in Laser Eye Surgery." All About Vision [cited February 22, 2003]. http://www.allaboutvision.com/visionsurgery/custom_lasik.htm . Gonzalez, Jeanne Michelle. "To Increase LASIK Volume, Know Your Market." Ocular Surgery News. September 1, 2002 [cited February 23, 2003]. http://www.osnsupersite.com/view.asp?ID=3473 . Gottlieb, Howard O.D. "The Changing LASIK Patient." Ophthalmology Management. February 2001 [cited February 22, 2003]. http://www.ophmanagement.com/archive_results.asp?loc=archive/2001/february/0201038.htm . "LASIK Eye Surgery." U.S. Food and Drug Administration Center for Devices and Radiological Health. October 1, 2002 [cited February 20, 2003]. http://www.fda.gov/cdrh/lasik . "Refractive Errors and Refractive Surgery." American Academy of Ophthalmology [cited February 23, 2003]. http://www.aao.org/aao/newsroom/facts/errors.cfm . An ophthalmologist performs LASIK, but because it is a relatively new technology, the surgeon may not have received training as part of his residency. It is more likely the surgeon has completed continuing medical education courses or may have had training provided by the laser companies. He may also have received training as part of membership in an organization such as the American Society of Refractive Surgeons. Before and aftercare probably will be provided by a co-managing optometrist. The optometrist usually performs the pre- and post-operative exams, and also discusses the patient's suitability for LASIK and any potential problems. Ophthalmic technicians may perform preliminary testing, including corneal topography and corneal measuring. Laser technicians are required to have special training provided by the laser manufacturer. Surgeons may perform LASIK in a hospital where they rely on the hospital staff for support. Because lasers are expensive, some surgeons pool their resources and purchase a laser that they share at a freestanding surgery center. LASIK is also provided by surgeons at surgery centers owned by refractive surgery companies. These businesses hire support staff, optometrists and surgeons to perform LASIK. How many LASIK procedures have you performed and how long have you been performing them? Who will handle the aftercare, the ophthalmologist or co-managing optometrist? What is the experience of the laser support team? How many of your patients achieve 20/20 or better? What percentage of your patients have serious complications? Minor complications? If the patient needs an enhancement, is that an extra expense, or is it covered in the original fee? Thanks for this article , please do more up dating , linked with demonstrative pictures . I find the article helpful for the information. A careful application of Lasik treatment to eye problems should be observe by both patient and the practitioner. Surgeon atNew York Lasik Surgery are known to its reputation for expertise, the most safest and accurate Lasik solution in New York. You may want to visit their clinic. I think the risks are not true how can i find the references of risks?